Whispers in the Loggia: "Make No Mistake, The Stakes Are High"
"Make No Mistake, The Stakes Are High"
As the US bishops prepare to double down on their most intense policy push in a generation, earlier today -- the 223rd anniversary of the introduction of the Bill of Rights -- brought a fresh round of rallies for religious freedom in cities across the country, many of them led by local prelates. As previously noted, an extended discussion on religious liberty is slated to be the lead agenda item at next week's June Meeting of the Stateside bench in Atlanta. The national Fortnight for Freedom, meanwhile, begins June 21st with a nationally-televised Mass from Baltimore's Basilica of the Assumption -- a temple designed by the country's founding bishop and the future architect of the US Capitol to symbolize Catholicism's marriage with the American experiment. 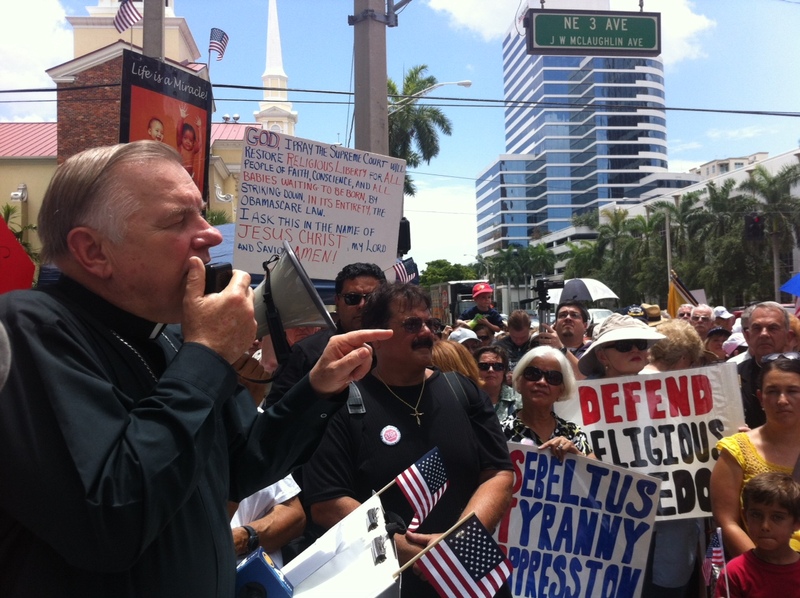 SVILUPPO: In what seems to be one of the larger rallies, a crowd estimated at 2,000 took part in the protest yesterday in Florida's Venice diocese. The Gulfside group was led by Bishop Frank Dewane, a onetime Vatican official who, before entering seminary, served as an NBC correspondent in Moscow in the days of Soviet rule.